Following the successful launch and mast stepping on 30th June 2011, on 1 July the newly restored St Patrick set sail sporting her original rig for the first time in at least 70 years. Final Preparations were carried out by staff from G.L. Watson & Co. and Fairlie Restorations with rigging work undertaken by Martin’s Rigging. Sails were bent on and, as with the first set of sails built over 92 years ago, Ratsey & Lapthorn provided an immaculate hand finished wardrobe. Under sail St Patrick fulfilled all the ambitions of the team that have worked meticulously to ensure her accurate restoration. Her light hull is easily driven and stable thanks to a ballast keel, centre board and a good deal of form stability. Her rig which was amongst the very first Bermudan rigs designed in the UK is low aspect with a mast well forward and a very long boom. The fears of some that this would prove unbalanced were quickly proven to be ill-founded and St Patrick is a well-mannered delight on the helm. Easily managed, St Patrick’s trials also proved that she is very fast with speeds in excess of 6 knots and occasionally 7 knots being recorded upwind. Having now enjoyed the same sailing experience as those when it first emerged in 1919, St Patrick’s owners were both delighted and proud to have ensured the highest standards of authenticity in the restoration. 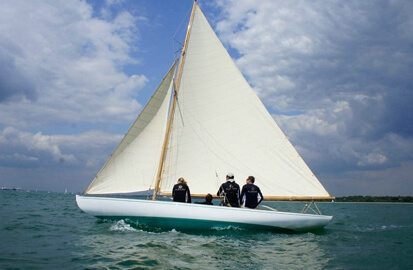 After final varnishing and fettling back at Fairlie Restorations St Patrick will be ready to take part in the 2011 Panerai British Classics Regatta. From there St Patrick will travel by road to her new home in the Firth of Clyde.